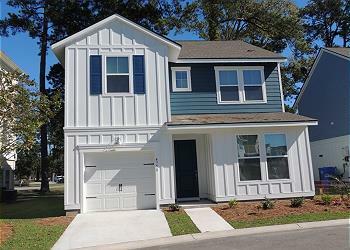 Brand new Premium home as of November 2017! Four bedroom three baths home from an owner who takes great pride in his home and your vacation rental experience! Near Downtown Attractions and One Mile from Beach! Sanitation, Safety, Comfort and Convenience rule?Brand new cool gel memory foam mattress in every room for your comfort. This beautiful home is equipped to sleep a total of eight people comfortable with it's large open floor plan. Stainless Kitchen w/ Granite, Keurig, Gas Stove and Central Heat, Large Screen TV w Cable, Wi-Fi, Roku, Washer & Dryer, Sling TV, Door Code Lock for Family Access... The Complex is not equipped with a pool however just 2 miles away and for a small fee the Pepper Geddings Recreation Center is ready to handle all of your recreational needs. Book today your are going to love calling the Cloisters at Myrtle wood your home away form from home.